Data recounts a day in his life in a letter, while Chief O'Brien gets married and the ship delivers a decorated Vulcan ambassador to the Romulan Neutral Zone. Data is sending his letter to Commander Maddox, from "The Measure of a Man." I love Data's logical, empirical approach to telling O'Brien that Keiko's wedding cancellation is good news. This episode, by offering Data a chance to dialogue his thought processes, is filled with quirky, funny things like that which help to flesh out Data's everyday motivations. I kind of like the idea that people still give gifts, even though there is no money or strictly material obsession. If anything, it forces the gift-giver to put more thought into a gift. I want to know more about Andorian marriages. They require groups of four?! It looks like Gates McFadden is doing her own dancing, but the double for Brent Spiner isn't very convincing. It's cool that there is an obvious main story happening, involving the Neutral Zone and the Romulans, but it's treated like the B-story. This episode is like a regular episode flipped on its head. Picard actually loses to the Romulans in this episode. I'm glad he doesn't win all the time. This episode offers a chance to see some of the more mundane aspects of life aboard the Enterprise. While not an exciting episode--and though it runs a serious risk of turning the show into a soap opera--it does offer a chance to expand the show's mythology. Data is clearly the protagonist and the character explored most, but by cleverly including every major character and showing the more banal side of life aboard a starship, you could easily look at this episode as an exploration of the Enterprise itself, as a character. This is the first appearance of Keiko, who will become a major recurring character throughout TNG and DS9. The toying around with point of view is something the show will continue to do in the future, as in the episode "Lower Decks." 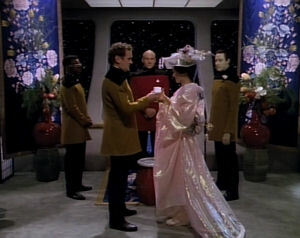 Data's conversation with Troi about the possibility of his getting married foreshadows the later Season 4 episode "In Theory," in which he tries dating. That episode can be seen as a companion piece to this one. Romulan chess games are fun. I think that's what's missing in Star Trek: Nemesis; it's a movie that involves the Romulans, but it doesn't contain any of the strengths of Romulans as characters.